Skin problems may be common among people of all age groups, but no one at all is okay with having them! Are you tired of having bad skin days every day? Have you tried almost all the products in the market and are still struggling with your skin? Worry no more. 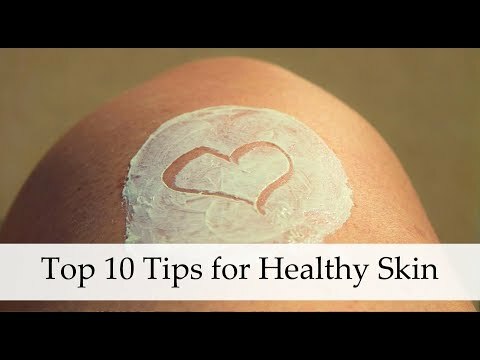 We have put together a list of the top 10 tips for healthy skin that will do you a great deal of good! Your face is always in-focus and in full view of all those who meet you. If you want to look youthful and bright, it is very important to take good care of the skin on your face. You must ensure that you wash your face well with products that suit your skin to avoid the ill effects of dirt and allergic reactions. Give your face a good scrub before going to bed, and when you wake up in the morning, remember to cleanse, tone and moisturize your skin. It will do your skin a huge favor for the long run. Going through daily routines of work and enjoyment, our bodies accumulate sweat and dirt, which can cause itching and rashes if left on the skin for too long. A good bath with warm water, and soap or body wash that suits your skin will help keep your body clean and free from the danger of germs and skin infections. While using makeup will enhance your features and make you look more attractive, leaving those products on for too long can destroy your skin and leave it looking lifeless and dull. Looking good is not only important in the present, but also in the future, and so, makeup products must be used responsibly. Using good quality makeup and cosmetic products, and taking them off before you go to bed is absolutely essential for good and healthy skin. Also, you must not forget to clean your makeup brushes and applicators well to remove any of the products left on them that may breed germs and cause skin problems when you use them the next time. Your hair, too, gets greasy due to pollution and dirty surfaces it comes in contact with. If your hair is then allowed to touch your face, it is bound to lead to acne and other skin problems. Using oil-based products in your hair only makes it more prone to collecting dirt. It is therefore, more advisable to use water-based products for your hair to keep it fresh and preventing it from attracting and collecting dirt that may harm your skin. Tying your hair up or keeping it away from your face will prevent contact with your skin and not allow any possible dandruff or dirt to affect it. Bathing towels, bed sheets, pillow cases, and face napkins are items that we use on an everyday basis. However, we do not realize the amount of dirt that they collect because we don’t use them continuously throughout the day. It is important to wash your towels and bed linen at least once a week to maintain hygiene and keep good health. Your pillow case and face towel, in particular, need to be washed and changed regularly as are used directly on your face after being in contact with your hands and hair. In today’s technologically advanced world, everyone owns a smart phone or a basic one at least. With the increasing emphasis on staying connected, our phones are one of the most used items in our lives, which makes it also one of the dirtiest items we possess. We take our phones with us almost everywhere, expose it to dirt, pollution, and germs, and then put it in direct contact with our faces! If you find yourself experiencing bad skin on the sides of your face, maybe it’s time to start cleaning your phone’s screen to get rid of the dirt and save your skin from its ill-effects. Your hands are involved in every single thing you do, and so, they collect germs and grime along the way. Touching your face with all that dirt will definitely give you bad skin. To avoid such a scenario, it is most advisable to wash your hands well with soap and water at regular intervals, and keep your hands off your face, especially if you already have breakouts or an infection. Green leafy vegetables help in better digestion and also detoxify your system. This in turn, helps you to have healthy and glowing skin. You might notice breakouts near the sides of your mouth or heat boils on your skin if you have been eating a lot of oily and junk food items. Making a healthier switch in your diet will not only keep your digestive system in good order, but will also improve the condition of your skin considerably. Drinking water helps to flush out toxins in your body and keep your system clean and healthy. We tend to forget to drink water as we go through our busy schedules every day. However, we don’t realize how much we need it until our bodies start showing signs of unhealthiness. And the first signs will appear on your skin. So, if your skin starts breaking out often, take that as a wakeup call to start drinking as much water as possible, and make it a regular habit. You’ll be glad when you see the results. When you sleep, your body is not just resting, but also healing and rebuilding itself. So, when you cut down on sleep, you’re actually just depriving yourself of a healthier and better state of existence. Sleeping well will save you from the struggle of dark circles and also keep you feeling a lot more active and energetic which will show in the way your skin begins to glow too! We hope that these tips help you to care for your skin, and give you great skin days, every single day! WeBeingFit brings you top 10 handpicked suggestions to get healthy and flawless skin by completely being in your comfort level. Just make sure you are following these simple methods and you are good to go.